Accenture developed a new and exciting Virtual Reality game to introduce first year students to new technologies and peak their interest in STEM before they select their exam subjects. Accenture learning research indicates VR as an immersive learning solution has the potential to increase retention rates by 30%. In the game, students are challenged to assemble a robot and program the robot with instructions to collect the ocean’s waste. Through an exciting, immersive learning experience, students will develop their critical thinking, problem-solving and technical skills in a fun and interactive way. The students also completed a misinformation activity where they used analytical skills to identify fake news articles. In partnership with Junior Achievement Ireland, Accenture identified two local schools to participate in testing. In early October, 11 students from CBS Westland Row tested the first phase of the game in Accenture’s Innovation Centre, the Dock. Based on the student’s feedback, further developments were made to the game and more complex solutions were added. The VR game was then showcased at a STEM Event held in the Dock with iWish, Business in the Community Ireland and Dublin City University. Further feedback was gathered at this event and an updated version of the game was developed. 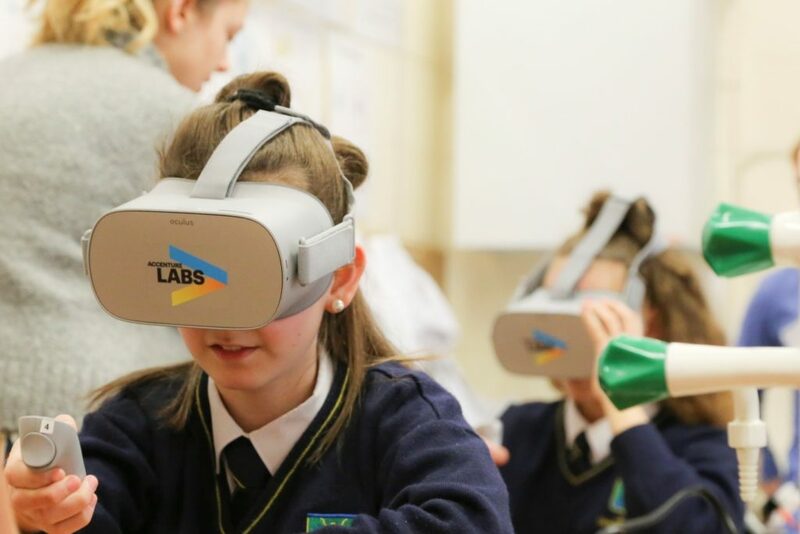 In December the Virtual Reality game was piloted with Larkin Community College. In what was an extremely fun & exciting day for everyone involved, 60 students tested the game over 3 hours. The students thoroughly enjoyed the experience with students’ saying, “I think the experience was great because it taught me things”, “It’s so cool, I feel like I want to try it on again and again! !” and “I liked doing something different to learn”. The game was also well received by the teachers who provided some key insights into how the game helps students to self-discover, build confidence and to speak up when they would normally be quiet as well as how it challenges students to keep working at problems they found difficult, building resilience. The best thing about the game? Watching the excitement on the student’s faces as some of them use VR for the first time. In early 2019, Accenture will continue to partner with Junior Achievement Ireland and will have volunteers facilitate workshops in more schools across Dublin.